The Alley Theatre hedges its bets each holiday season by presenting its fairly traditional version of Charles Dickens’ A Christmas Carol in tandem with David Sedaris’ wildly irreverent Santaland Diaries – the first filling the huge theater upstairs, the second filling the smaller space down under. 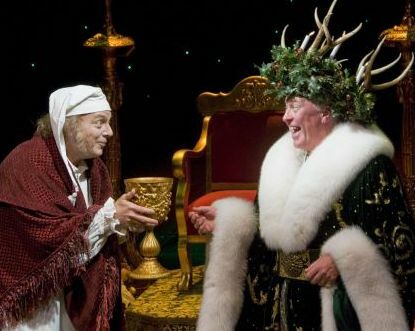 Oddly but delightfully, many Houstonians now have a holiday tradition of seeing both shows – the first more likely with the kids. We’ll be checking out Santaland starring Todd Waite next week. This time, we’ve got to report that if you’ve loved Christmas Carol at the Alley the past few years, you are certain to love it again. With company stalwart James Black in the director’s chair, rather than onstage, the update originally created by Michael Wilson comes off as surprisingly un-stodgy. Some of that, of course, comes from sly bits of attitude that go for an easy, arguably cheap sitcom-level laugh. But neither at the show’s important conclusion nor at any juncture along the way does such license undermine the hard lessons Dickens is teaching. If anything, license seems to set the hard lessons in relief, making them feel harder still. As most understand by now, even if they’ve read only Oliver Twist from the Dickens shelf or seen only the Lionel Bart musical Oliver, the author was militant in his commitment to the poor. There is no record that Dickens himself ever “Occupied” anything, but he surely would have been tempted to. The now-familiar emotional journey of one Ebeneezer Scrooge through the revelations of three ghosts on Christmas Eve doesn’t teach him a thing we don’t all know to be true. And really, as what Scrooge decides to do is personal rather than political, it comes off as heartwarming-with-an-edge. In other words, profoundly human, profoundly real. For those who’ve seen TV versions of A Christmas Carol featuring everybody from Mr. Magoo (my childhood favorite) to Mickey Mouse, the darkness and even scariness of the Alley production might come as a shock. Still, the story has to be one of literature’s first cases of “scared straight,” since the threat of dying alone, despised and purposeless is what turns Scrooge around. Presumably, nothing less would have worked. An extra set of ghosts garbed in eerie white, still carrying the instruments of their murders, joins the spirit of Jacob Marley chained to a very real-seeming hell as near constant reminders of what this author saw in the afterlife for those who don’t live and give in the present one. The Alley cast, led by Jeffrey Bean as Scrooge, seems largely unchanged from last year – as in, why tinker with a very good thing? This is a perfect role for Bean, mean, small-minded and sniveling through all but the last few minutes, then hysterically joyful at the end. Other standouts of a near-flawless performance include James Belcher as the Ghost of Christmas Present and Chris Hutchison as Tiny Tim’s genuine and loving father, the famously overworked and underpaid Bob Cratchit. David Rainey is back again too, as Marley’s ghost and, even more memorably, done up in wig and Victorian dress as Scrooge’s bizarre housekeeper, Mrs. Dilber. I was lucky enough to see the Beatles perform live twice – at City Park Stadium in my hometown of New Orleans on Sept. 16, 1964, and at Suffolk Downs in my father’s hometown of Boston on Aug. 18, 1966. The fact that these two concerts came from their first U.S. tour and their last was never lost upon me. So much had changed in the world during those two short years; and when it comes to music, most of what had changed was because of the Beatles. Now, thanks to the Broadway touring company of Rain (with only two more shows today at Houston’s Hobby Center), I might actually consider saying I saw the Beatles perform live three times. And, in all seriousness, the Boys have never sounded better. 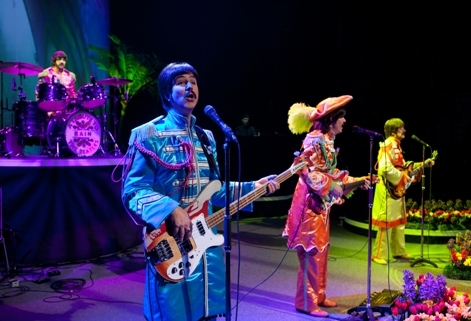 At heart, the show is a two-plus-hour concert by a Beatles tribute band – and, yes, I know, there are a lot of those. I caught one called Revolution on a cruise ship once, and it was scary how much its “John Lennon” looked the part even in the bar after the show. Houston’s own Fab Five plays some amazing Beatles music, though I do hate it when they play other people’s stuff from the ‘60s around the edges. Impressed as these listening experiences invariably leave me (I was in a band as a teenager and tried to play Beatles music the minute it hit the radio), it must be broadly doable to lots of musicians. Rain brings two things to the Hobby Center that most tribute concerts don’t or can’t. For one thing, the four guys playing the Beatles – Steve Landes as Lennon, Joey Curatolo as Paul, Joe Bithorn as George and Ralph Castelli as Ringo – work harder at their characterizations than the norm. It is a Broadway show, after all. Most tribute bands do something to act or sound like their “characters,” but these guys take the acting seriously. The show’s program makes it sound like they’ve been at this since the ‘80s or even the ‘70s, so they’ve got each role down to nuances by now. 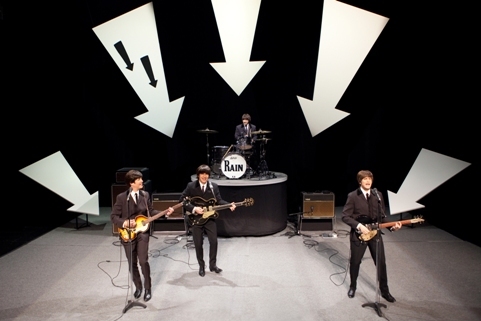 Secondly, the show features Broadway-style production values: evocative lighting and terrific costumes from all major phases of the Beatles’ career (including that rarely seen quasi-military get-up from the Shea Stadium concert in 1965), plus an eye-popping series of time-capsule montages of silly TV commercials, newsreels from historical events, and a colorful nod to mind-altering drugs. No part of this is more impressive than the scratchy, black-and-white, and thoroughly iconic newsreels of the Beatles themselves, but with the actors you see onstage inserted somehow into the frames. John, Paul, George and Ringo – say hello to Forrest Gump! As Rain began to near its end, after a delightful jam session the Beatles themselves never did publicly (“We Can Work It Out,” “In My Life,” “Girl,” “Mother Nature’s Son” and a wild hoedown-ification of “I’ve Just Seen a Face”), I found myself thinking about what isn’t here – and probably should never be here. Though the faux-Boys do seem to grow a bit older through the show, they never grow any older than the day each song was created. Marriages and divorces are left out, not to mention an extremely bitter breakup during which each Beatle recorded separately and left it to the studio to paste things together. Most of all, there is absolutely no reference to the cancer that took George from us, or the late-night bullets outside the Dakota that silenced the seemingly unsilenceable John. There is certainly no mention of the fact that these two guys are dead. Looking around me, past two of my own daughters, to all the people of several generations bouncing where they stood at their seats and singing the ”Na-na-na” to “Hey Jude,” I understood suddenly what Rain really is. It’s a chance for us to grab hold of human history, including our own lives, and rewrite it all with a happy ending.